Wind can tickle your face or whistle through an open window. Did you know that some wind travels faster than a car? Air is always moving. We can’t see air move, though we can watch it push clouds across the sky, or shake the leaves of a tree. From gentle breezes to powerful hurricanes, find out about the wind-what causes it, how it can be used to help us, and how it affects the weather. Learn how to make your own weather vane, and find out, in simple terms and with playful illustrations, just what makes the wind that blows all around us. As I grew up, I took the expression “go fly a kite” literally. It didn’t take any convincing, I loved to fly kites. I made some, bought others, and always wanted to see how high I could fly them. I would tie several balls of twine together so I’d have the longest string possible. With a good breeze I flew kites until they were just the tiniest dots in the sky. One day, I felt a sudden tug on the kite string as a strong gust of wind caught the kite high above me. The string floated to the ground in a swooping, curling line, and the kite that had been a dot disappeared. Gone was the small sky ship of paper and sticks. I calculated from the direction the wind was blowing and how hard, where I thought the kite might be. I hopped on my bicycle, and about a mile away, after riding up and down a couple of blocks searching every tree, saw my kite stuck in the branches of a tree. I felt lucky, as if I’d found lost treasure, and I climbed and got it. I liked to climb trees anyway to sway with them in the wind. I’ve felt the push of winds while sailing in boats, the hot winds of the tropics, and seen boards and trash cans flying sideways in hundred-mile an hour winds of storms. I’m sure you’ve often felt the wind too. 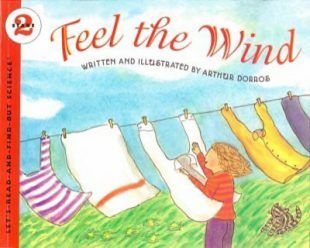 In writing and illustrating this book I learned how both strong and gentle winds come to be, more about what they can do, and their part in the weather around me and you.